I mean, it’s a fair question to ask, no? The Caps have never won a Stanley Cup but they did recognize their 1998 Final appearance with a banner. 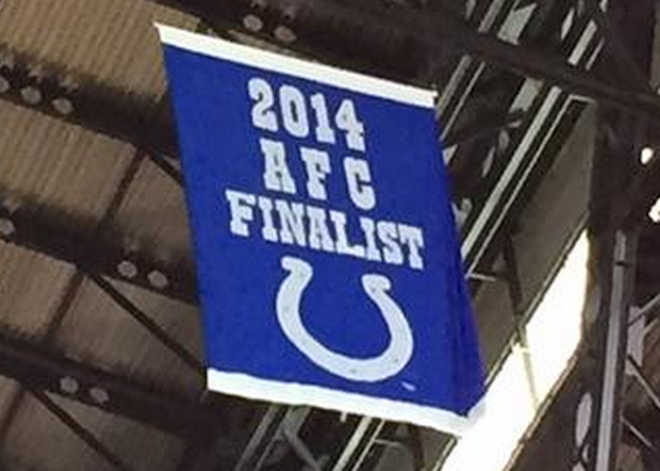 So, are they going to continue to go all Indianapolis Colts on us or not? I think they should. When you have a tradition of hanging non-playoff championship banners you need to proudly wear that badge with honor. And don’t do it quietly either. No, no, no. If the Caps advance by winning Game 7 tonight then prior to the national anthem at Game 1 of the Eastern Conference Final against Ottawa they need to raise an Eastern Conference Finalist banner. Bring out members of the 1998 team and have them pull the ropes that raise the thing. Maybe even toss in a video montage of the playoff run so far. Really turn it into a whole production and create a special “I remember where I was” moment for the fans, all while letting the Senators know you’re not messing around. Otherwise, what are we doing here? Of course that could always backfire if you get up to Ottawa for Game 3 and they raise their own Eastern Conference Finalist banner right back in your face. Talk about a potential momentum killer. Luckily for the Caps you can’t take away raising a Conference Final appearance banner first. So I suggest they get right on it. Raise ’em while ya got ’em. Previous Previous post: What Can We Expect From The B’s This Off Season?